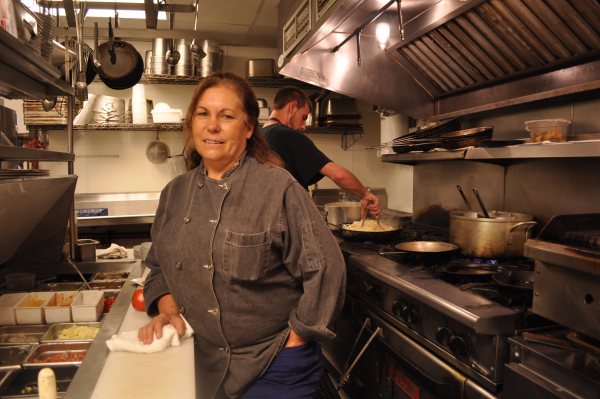 As the owner and executive chef of The Naked Oyster Bistro and Raw Bar in Hyannis, Florence Lowell knows a thing or two about kitchens. Lowell visited NOAH the week after the day center opened its doors to clients and was impressed with what she found. “I think they have a pretty nice facility when it comes to the kitchen,” she said. Still, she saw room for some minor improvements. When NOAH director Greg Bar expressed interest in offering a Sunday breakfast Lowell bought the shelter a griddle. Beyond that, Lowell is planning on putting a team together to spend a day and organize the kitchen so people can access food and ingredients better. “I think what they immediately need is to get a few things organized with labels so everybody can find things right away,” she said. She also noticed the large freezer needs shelving, another project she has on her to-do list at NOAH. And Lowell hopes to serve as a connection between her restaurant’s vendors and NOAH as a way to provide fruits and vegetables to shelter clients. Lowell has maintained her charitable giving on the Cape, where she is actively involved in fundraisers for Cape Abilities Farm in West Dennis, as well as Spaulding Rehab, where her husband Dr. David Lowell is the chief medical officer.